Wondering what others have to say about St. Rita School? We invite you to take a look at what some of the families think about our school. "Dear our beloved Saint Rita teachers! We are so happy to share with you our daughter's letter of acceptance to Lauralton Hall! We are so proud very proud of her! We wanted to extend a huge thank you to you all for all of your dedication, hard work, caring, nurturing and understanding! We thank you for guiding her through middle school, helping her transition from public to catholic school and creating an environment where our daughter is happiest. We appreciate everything you have done spiritually, academically and emotionally!" "I do have to say, one never can quite quantify just how St. Rita prepares its students for the high school years and beyond until your own child enters those high school doors. Both of my children are having two completely different high school experiences, yet both are equally prepared because of their time at St. Rita!" "I love giving back to the school that taught me so much. It feels so rewarding knowing I am contributing to the education of those young students, some just like I was at their age, maybe a little shy, or maybe a little silly, but definitely hungry for knowledge; knowledge that St. Rita’s has given me and will continue giving to its students as long as there are those who are willing to share." "St. Rita School represents the best education: the administration is devoted and compassionate, the faculty tirelessly dedicated to the student, and the family community committed to Christian ideals and values." "We knew that St. Rita School would reinforce all the family values that we were teaching our children. My educational experiences at St. Rita were wonderful, and that is what I wanted for my children." "Our family is truly blessed to be a part of a community that is giving and selfless. We are grateful to be part of the St. Rita Family and blessed to have our children learn and grow in such a wonderful place. The St. Rita community has become our second family and has taught us the value of family and giving." "We've come to realize what a special school St. Rita really is. At St. Rita, teachers genuinely care for each student as a person." "We are so incredibly thankful for your wonderful faculty and staff that help guide our child academically and spiritually. Your love and devotion to the children and families of St. Rita School is a tremendous blessing." "Our children look forward to the 'high fives' each morning and talk endlessly of how much they love their new school. 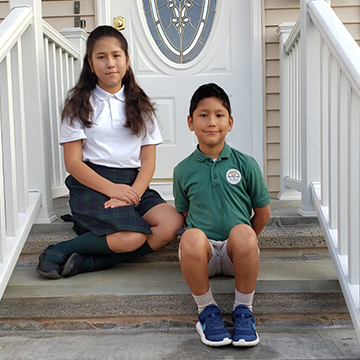 Everyone at St. Rita welcomed us and made us feel right at home." "We do not have the words to express our gratitude to the faculty and the work you have done with our son. We truly feel he was called by God to be a student at St. Rita School, and we could not be more thrilled with the experience he is having." "Our son has received an outstanding education at St. Rita school that I believe will serve him well in high school and beyond. We are truly grateful to the teachers for that foundation, and to you for your leadership and support."